Last weekend saw one hundred rally cars descend on Kintyre and Machrihanish Airbase for the first Mach 1 Stages rally. The event, which was organised by Dunfermline Car Club (DCC), was held over two days (Saturday 5th and Sunday 6th July) and attracted record breaking entries for a first time event. There was a fantastic turnout from the local community with over 2,000 spectators and an astounding 90 volunteers signed on for marshalling. Hotels, B&Bs and campsites in Campbeltown were fully booked with competitors travelling from all over the country to take part. Competitors were delighted with the new venue and the variation of rally stages, which was situated on and around the 10,000 ft taxiway. 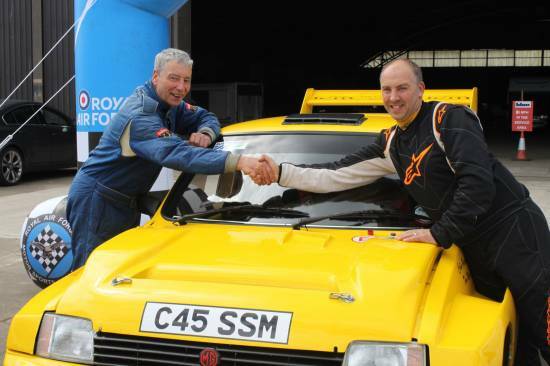 The overall winners after the two days of rallying were Tom Morris of Glenrothes Motor Sport Club and his co-driver, Colin Harkness from Aberdeen, driving a Metro 6R. Event co-ordinator and DCC committee member, David Hatrick said: ‘My phone has not stopped ringing since Sunday with people calling and texting to give their thanks and congratulate DCC on the success of the event. We were blown away by the support of the community and would like to thank everyone who came along to help or spectate. Everyone played a part. Also a special thanks to Ian Wardrop, chairman of MACC charity and his helpers’. Jim Martin, chairman of MACC Development Ltd said: ‘On behalf of everyone at Machrihanish Airbase Community Company, we would like to thank all of those who helped over the two days and in the lead up to the event. Particularly local farmers, Campbeltown running club, the rotary club, West Coast Motors for running the spectator shuttle buses and last but not least Argyll Bakeries for the catering across the whole weekend . We hope this is the first of many rallies at Machrihanish Airbase and to see DCC make this an annual event’. The one and only local entry came from George Fell (27) of Glenbarr, who was co-driven by his mum, Lois (56) in the family’s Subaru Impreza. George and Lois finished 56th overall in their first ever rally, after being seeded at 91.